Still, natural mineral water from the Peak Districts. Perfect for the gym, the office, your busy week! Whether you're out and about, at your desk, or at the gym - this pure British natural mineral water is perfect for every type of busy life. 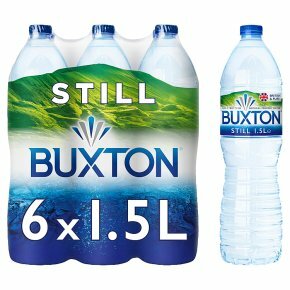 Our 6x1.5L multipack mans you can be prepared for any occasion, and will help to keep yourself healthily hydrated*. *Water contributes to the maintenance of normal physical and cognitive function and normal regulation of body temperature. At least 2L of water, from all sources, should be consumed per day as part of a healthy diet and lifestyle. Our product is 100% natural. Free from additives, artificial colours and preservatives. Zero calories as is sugar free.